In clinical practice, gastric emptying and the success of gastric feeding is assessed by measurement of gastric residuals. A new setting easily allows bedside measurements in ventilated ICU-patients by 13C-technology to evaluate gastric transport. 13C-acetate added to tube feeding will be absorbed into the blood stream from the duodenum and oxidised to 13CO2 in the liver. The ratio of 13CO2/12CO2 in the expired air can be determined by infrared isotope-selective spectrometry (IRIS). Increasing expiratory concentrations of 13CO2 indicate transport of the applied tracer from the stomach to the duodenum. 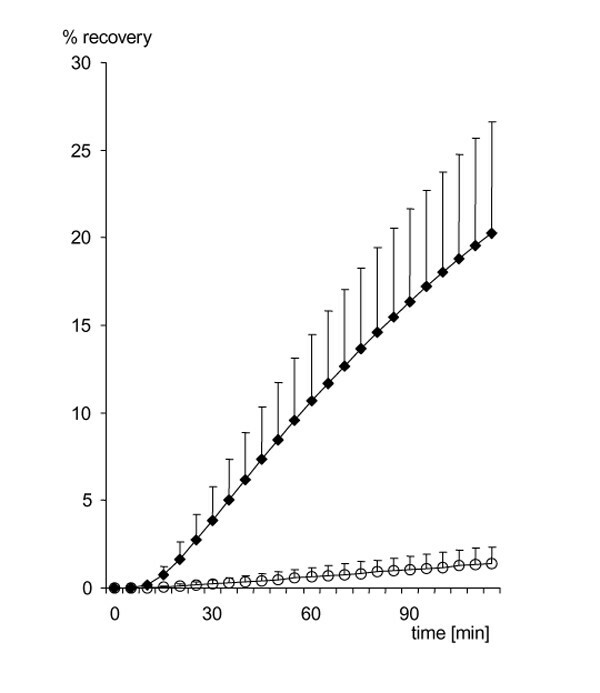 In 11 healthy volunteers breathing spontaneously via a tight CPAP mask on a Dräger Evita respirator system, 13CO2 enrichment in the expired air was measured for two hours after ingestion of 150 mg 13C-acetate in 50 ml tube feeding. In nine ventilated ICU patients measurements were performed to determine expiratory 13CO2/12CO2 ratios after administration of the same amount of tracer and tube feeding via gastric tube. Gastric reflux and the total amount of tube feeding were recorded before measuring. The new setting was validated in volunteers. About 20 to 40 min after ingestion of the tracer, peak values (% of 13C dose/h) were recorded. Within two hours the cumulative recovery was 20%. In the ICU patients only a small quantity of the applied tracer (<5%) was recovered independent of reflux amounts. We could not quantify gastric emptying by this new setting in ICU patients. Failure might be due to changes in transport mechanisms, resorption in the duodenum, metabolism and pool exchange compared to healthy volunteers.